Oatmeal and peanut butter are two of my favorite cookies, so what could be better than combining both? I like to include these in my holiday cooking, only then I will sprinkle them with red or green sugar. It’s become a new tradition to bake these along with my favorites, Pecan Balls and Ginger cookies. Of course, these are a tasty snack year round. The oats and peanut butter also offer nutritional value. That’s a plus in any cookie. I’ve been making this recipe for over thirty years now. (Yikes!) The cookies were an instant hit with all the kids who tried one, so they became a standard in our house. Plus, they seem a bit healthier than many cookies since they contain old fashioned oats and peanut butter. 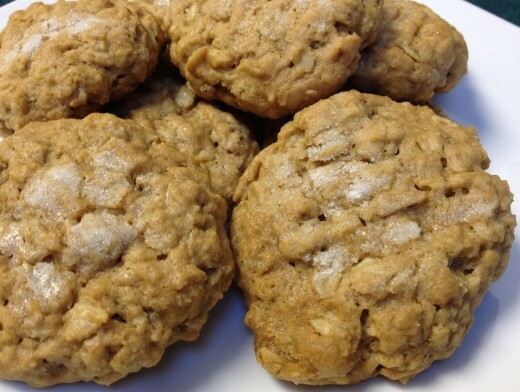 Oatmeal peanut butter cookies are a favorite for breakfast too! The recipe calls for the dough to chill at least a couple of hours, so I will often make up the dough the afternoon before, let it chill overnight, then bake them first thing in the morning. They smell wonderful baking and taste delicious, warm and fresh from the oven. Besides, you can grab them to eat on the run, whether in the morning, or after school and work. I like to make them small–snack size–so I roll them into one inch balls, but you can always make them larger if you prefer too. Satisfying, filling, and delicious! Mix together butter Crisco, peanut butter and brown sugar until creamy. Add in water, egg and vanilla. Beat until thoroughly blended. Gradually mix in dry ingredients, and blend well. Cover and chill at least 2 hours so the dough holds together well. Flatten very slightly with fork, then sprinkle lightly with sugar. Bake for 10 to 12 minutes or until edges are lightly browned. One of my most used small appliances is my hand mixer like this one. It is so lightweight and easy to use. Having all the accessories in one container like the picture shows, makes it easy to grab and use. It has had plenty of power for everything I’ve made too. I even like the brushed chrome appearance of it. Stainless steel makes a perfect mixing bowl. They won’t break, they can last for decades, go through the dishwasher beautifully. Love this set with lids too. Especially handy for these cookies since they need to be refrigerated for a few hours. The lids make it so easy to stow in the fridge for later, whether making cookies, salad, or meatloaf. Mine have had decades of use now, though I don’t have lids. Wish I did. I don’t think I could bake without these terrific insulated cookie sheets. Without them, the bottoms of the cookies always got too brown before the tops were done cooking. No more! With these long lasting pans, no more burning. And since I use parchment paper to bake, clean up is so easy. Just wipe them off. Mine still look almost new and I’ve had them over ten years. Another item I couldn’t bake–or cook–without any more. Parchment makes baking so much faster and easier. The Kirkland package here hold over 160 feet of paper. That lasts quite a long time. Not only does it keep your cooking pans clean, but it also seems to help bake better. For big batches, when you pull the cookies out of the oven, it’s simple to pull the whole parchment piece off, cookies and all, so they can cool. That leaves the pan free for the next batch, with another piece of parchment. I use it for rolling out pie crusts, for prepping bread dough into rolls, even for prepping vegetables. It’s good to have the clean flat surface to work on, yet one you can pick up and move around too. Love this product! Kirkland Signature 587346 Non Stick Parchment Paper, 205 sq. ft.